In today’s increasingly connected homes, a fast, reliable Wi-Fi connection is no longer a luxury. We depend on Wi-Fi in so many ways: communicating with friends and family, sharing photos and videos, streaming movies and music, gaming, interacting on social media and so many other uses. When it works the way it’s supposed to, Wi-Fi is an amazing technology. When it doesn’t, it has a big impact on our daily lives. With SCTelcom’s carrier-grade Wi-Fi, you will have the latest technology plus we take care of managing and updating your network so you don’t have to. If you ever have an issue with your home network, we can access your Wi-Fi router remotely and help get things back up running quickly. *Program requires a 12 month customer commitment and will continue as long as the router is leased. No charge for initial install of router and connection of one device. Upon early termination of 1 year commitment, a $35 charge will be assessed. Device remains property of SCTelcom. If device is not returned at the end of your lease in working condition, a $125 charge will be assessed. Working in conjunction with our leased router is our Mesh Wi-Fi. If you are having trouble connecting Wi-Fi in certain areas of your home or if your device suddenly disconnects from the network for no apparent reason, it may be time to consider this type of Wi-Fi solution. Like your current Wi-Fi network, Mesh Wi-Fi uses a router to transmit the Wi-Fi signal your devices connect to. What’s different is that it combines the router with a series of small wireless devices -extenders – which you place in different rooms in your home. These extenders communicate with the router and provide you with a strong Wi-Fi signal everywhere, whether it’s your bedroom, your downstairs game room, your home office or even your backyard. 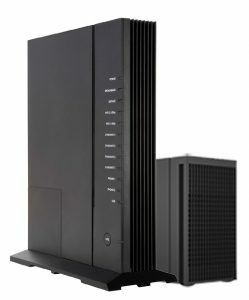 ** Extender works in conjunction with SCTelcom’s router lease program. Program requires a 12 month customer commitment and will continue as long as the extender is leased. No charge for initial install and connection of one device. Upon early termination of 1 year commitment, a $35 charge will be assessed. Device remains property of SCTelcom. If device is not returned at the end of your lease in working condition, a $125 charge will be assessed. Managed Wi-Fi is not required. You can set up your own Wi-Fi network but SCTelcom will not be able to troubleshoot or help with any Wi-Fi troubles you may have. What if I have managed Wi-Fi but have an issue with my Wi-Fi? Call our 24/7 help desk at 866-486-8821. We will troubleshoot your issue and if needed, a technician will visit your home to access the problem.